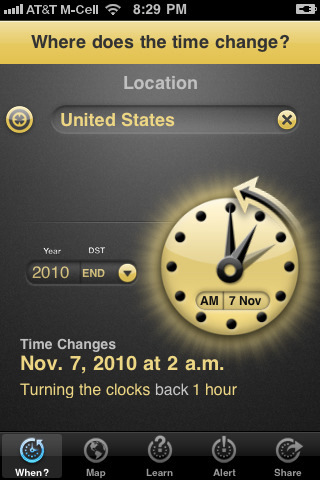 SpringAhead is an app that offers all that there is to know about Daylight Saving Time. It was developed by IDEA, costs $1.99, and is compatible with an iPhone, iPod Touch, and iPad. This is a great app to keep you organized and informed. One of the most interesting things I learned while using SpringAhead is that many countries do not use Daylight Saving Time. Even within the U.S. there are states and territories that do not observe it, including Hawaii. Another thing I learned: Daylight Saving Time is called “Summer Time” in other parts of the world because it was implemented so that we could enjoy sunny summer evenings. This app is not only filled with trivia, it provides a thorough explanation of Daylight Saving Time as well as its impact on each country. If you are a curious person and you get the urge to know what date and time Spring Daylight Saving Time (DST) will fall on in 2019 in Hungary, all you have to do is set up the Year, DST, and Country and SpringAhead will provide you with the correct answer: March 31, 2019 at 1 a.m. UT. You can find this information in the When? section of the app. In the Map section you are given a satellite view of earth that you can spin with your finger as if it were a globe sitting on your desk. The countries listed in the app are given light blue pinpoints on the map and you can zoom in and out to find different countries. Whichever country you choose on the map shows up in the When? section for you to figure out what the DST is. In the Learn section of the app you get an Intro, Anecdotes, Why?, and Worldwide. The anecdotes are actually incredibly interesting. The Why? section attempts to shed light on the reason for DST and who created it. 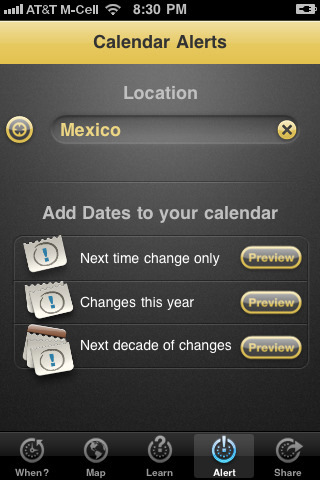 There is an Alert option that allows you to set calendar reminders for next year or the next 10 years letting you know when to switch your clocks. I know SpringAhead may not seem like a necessity, but I got a lot of use out of it. If you have always wanted to get a better understanding of the Daylight Saving Time phenomenon then this app is your best bet. AppSafari review of SpringAhead was written by Vanessa Paszterko on November 25th, 2010 and categorized under App Store, Education, Productivity, Reference, Utilities. Page viewed 3879 times, 2 so far today. Need help on using these apps? Please read the Help Page.